The white-tailed deer (Odocoileus virginianus), is ruminant mammal belonging to the Cervidae family. 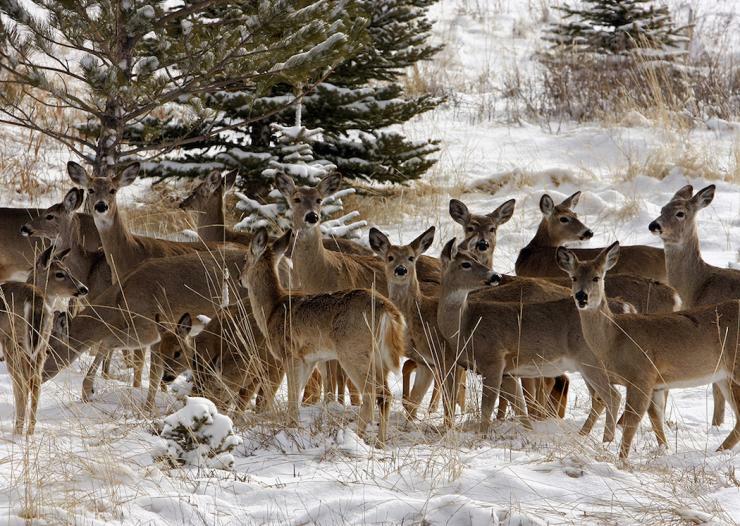 It is a medium-sized deer and a native species in Canada, USA, and Mexico. These dainty but skittish animals are often looked upon with admiration when spotted by those who live in urban areas. However, for those of us, like me that live in rural areas, deer are just another part of the background. I recently had fourteen deer in my backyard one morning this spring and that was a non-event. While nice to look at, deer are often a nuisance, munching up plants and vegetables from carefully planted gardens. So what do deer have to do with Curbside Classics? Earlier this past winter, while starting out on my pre-dusk morning commute on my narrow windy road surrounded by dense forest, I met a deer who decided she no longer wanted to live. Or at least that’s the only logical conclusion as to why a large doe seemingly in the prime of her life would leap mere feet in front a 5500 lb pickup truck. Then again, anyone who has had close encounters with deer knows that perhaps they might have been slighted during evolution when it came to intelligence. The road was covered with hard packed slippery snow, and despite my best efforts impact was inevitable. The -25 Celsius ambient temperature caused the plastic parts on the front of my truck to literally explode. Although the damage looked bad, upon closer inspection it was relatively minor. No sheet metal was damaged, and the majority of destruction was to the front end cosmetic plastics. All in all, the truck fared better than the deer, which jumped for her last time. These are the events that brought me to my short term experience with the subject truck. While my truck was in the body shop, I was given the choice of several rental vehicles. The rental lot was mostly Chrysler products, as it is affiliated to a local Chrysler dealership. There were Durangos, Caravans, 300s, and Grand Cherokees, but surprisingly nary a single Ram pickup. For trucks, I was left to choose between several Tacomas and Frontiers along with one Nissan Titan XD. 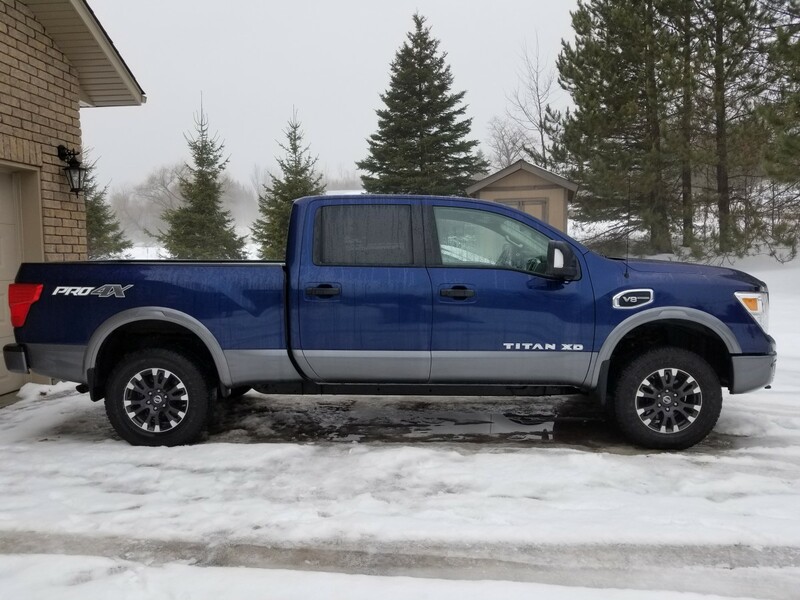 Since, I had lots of miles driving my brother’s Tacoma and I have no interest in the Frontier, I quickly chose the Titan XD. Nissan introduced the second generation of its Titan pick-up in 2016, starting with its new heavy-duty XD model with the new 5.0L Cummins diesel. This was later followed up by the gas-powered Titan XD and the light-duty Titan (half-ton) reviewed here by Jim Klein. Nissan is quick to point out that the XD is not a ¾ ton model, and is somewhere between a traditional half-ton and a ¾ ton pick-up. I suppose you could call it a 5/8 ton. 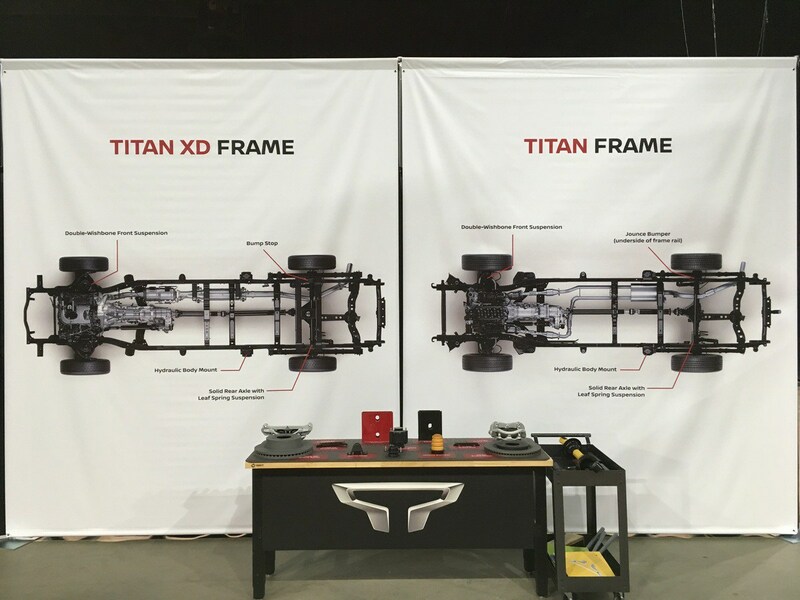 While the XD shares the cab and some other body parts with the Titan, it rides on its own significantly more substantial HD chassis. It also has a longer front nose, which results in a rather ungainly front overhang. The truck I ended up with was a well-equipped Pro-4X crew cab with a 6.5’ bed. The Pro-4X is a mid-level trim level, falling between the S and SV on the low-end and the SL and Platinum Reserve on the high-end. That said, the Pro-4X trim level is an off-road themed package and has a number of off-road related options that the other trim levels don’t get. This includes a hill descent control, electronic locking differential, Bilstein shocks, additional skid plates for the radiator and transfer case, Pro-4X embroidered seats and exclusive 18 x 7.5” wheels. 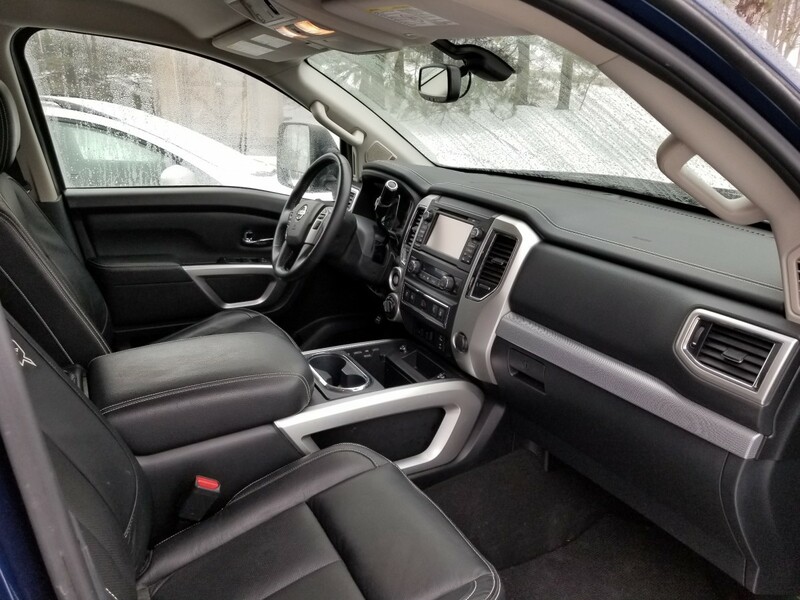 The truck I had also included a luxury option package that included heated and cooled seats, heated steering wheel, power tilt and telescoping wheel among many other features. This was a very well equipped truck, certainly far more so that I would specify for my own truck. Note the rear sway bar and Bilstein shocks. Immediately upon taking a seat in the Titan, two things struck me. First, the step in height is higher than a typical modern half ton truck. I am tall, so the tall step in height for most half-ton trucks is quite comfortable. 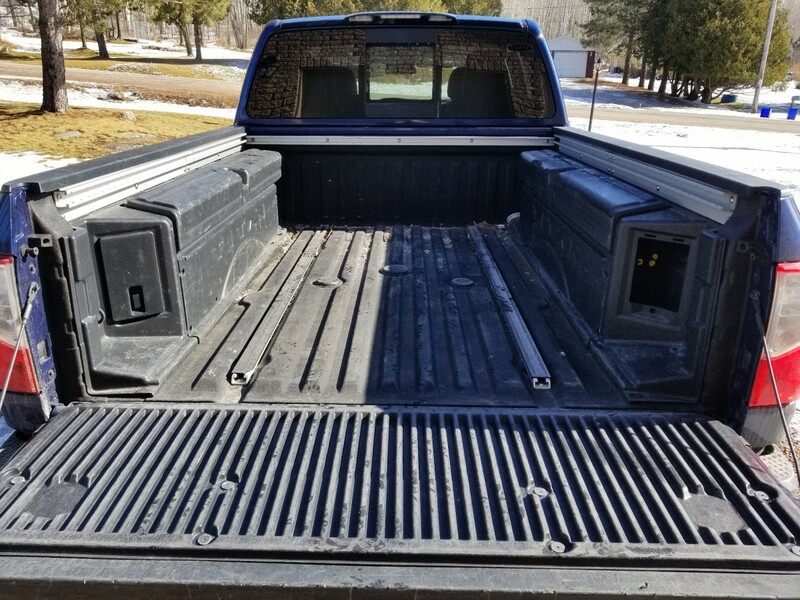 I prefer no step bars on pickups as I never used them. The Titan however was a bit of a stretch that made entry require some effort. Second, once I took a seat in the driver’s seat the visibility was somewhat less than what I was used to. The high cowl resulted in a shorter windshield and side window height, while the hood was quite long and flat for modern vehicle. The A-pillars were quite large and located at a spot that created a significant blind spot for me. Nevertheless, the visibility wasn’t to the point of compromising the driving, and I quickly adapted to the new environment. 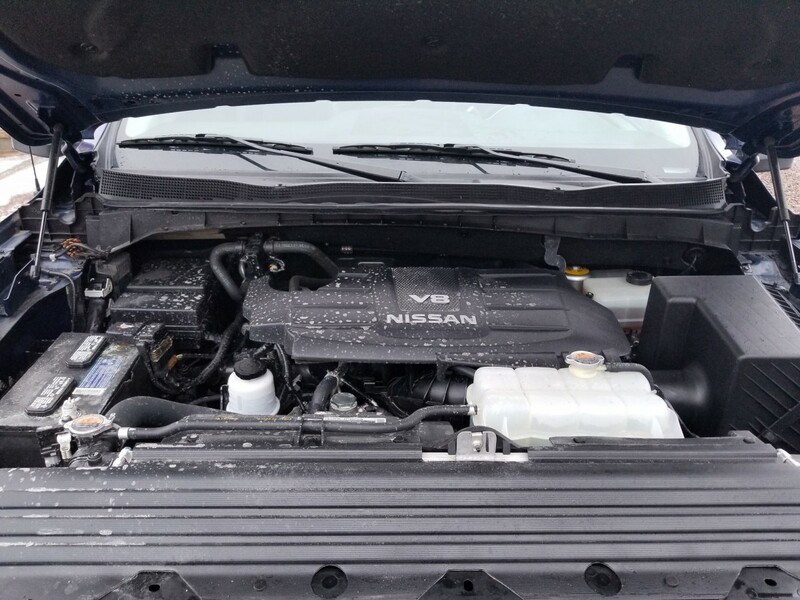 My rental Titan was equipped with Nissan’s 5.6L VK56VD V8 engine. The engine is a revised version of the 5.6L VK56DE V8 used in the previous generation Titan. Updates include Nissan’s Variable Valve Event and Lift System and direct injection to help increase the power and fuel economy. The changes boost power from 317 hp and 385 lb-ft to 390 hp and 394 lb-ft. In addition, a new 7-speed Jatco transmission replaced the outgoing 5-speed (diesel’s get a 6-speed Aisin). The new powertrain helps increase the fuel economy rating from 12/17 MPG to 15/20 MPG. Despite the higher power of the Nissan V8 engine, the Titan felt somewhat sluggish off the line. While powerful, the engine didn’t have an abundance of low-end power. Once up and moving the truck had more than enough power, with a strong mid and upper range. On the highway, it revved at about 1700 rpm at 100 km/h (62mph) and I noted that it would downshift relatively easily on modest grades. I did a few wide open throttle two lane passes and the truck performed very well despite its heavy weight. The V8 sounded terrific at high rpm. The shift algorithm of the transmission seemed to get confused at times at lower speeds sometimes upshifting too early to a higher gear and then having to quickly downshift. Overall the transmission operation wasn’t bad, but could use some further refinement. The extra mass of the heavy-duty XD became quite apparent with the ride and handling characteristics. Over gentle humps in the road the truck rode quite smooth and comfortably, but had a hint too much body float for my taste. The composure quickly diminished with broken pavement and chuck holes which caused the truck to crash and become harsh. Under these conditions the ride was definitely closer to a ¾ ton truck than a half ton. I did notice the chassis had excellent torsional rigidity, however over rough pavement the cab suffered from body oscillations. 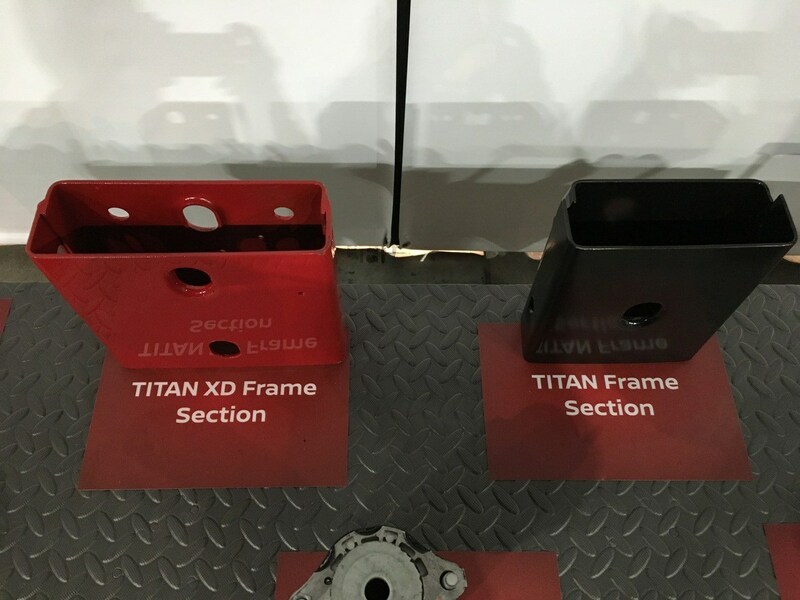 The Titan half-ton trucks use rack and pinion steering while the XD’s use recirculating ball steering box. The difference is apparent. While it had a decent level of effort, it lacked road feel and was fairly dead on center for a modern vehicle. Handling was typical of a large heavy truck, although I noticed it had fairly neutral cornering and not suffering from excessive understeer that inflicts many pickups. The brakes were firm and responsive and had little trouble slowing the truck down from high speeds. The interior was trimmed with nice modern soft touch materials on the dash and the door panels. Between the seats was a large centre console, but rather than a floor shift, it had a column shift. This meant the console having an abundance of storage. Many reviewers have raved about the seats on these trucks, which I found comfortable, but nothing exceptional. I did note that the heated seats were a little on the slow side to warm up in the morning. Front seat leg room was very good, while the rear seat was decent but considerably smaller compared to some of the competition. This truck had a 6.5 foot cargo box which had an above average lift over height even by modern standards. Notably, the box included built in provisions for a goose neck hitch, and a factory bed liner. This truck’s option package included plastic cargo boxes on the box sides. The awkward shape meant they weren’t particularly useful for storage and they also reduced the box width to less than 48”causing a problem for hauling 4 x8 sheets. I had the Titan XD for just over a week and during that time I logged about 500 miles. I used it for the same commute I subject my truck to on a daily basis and I also took in on a short highway trip out-of-town. According to the truck’s calculations, I averaged 15.3 L/100 km (15.4 mpg US, 18.5 mpg IMP). I thought the mileage was reasonable for such a large truck; however, it was a fair bit lower than the mileage I was averaging with my truck under the same driving conditions. It should be noted that this mileage was logged during sub-freezing temperatures with winter gas. As someone who tracks fuel mileage regularly, I can say these factors have a significant impact on fuel economy. Overall, I thought the Titan XD was a decent truck. However, I can’t say I’d buy one if I were in the market for a new truck. This isn’t because there was anything glaringly wrong with the truck; rather, it’s just overkill for my needs. 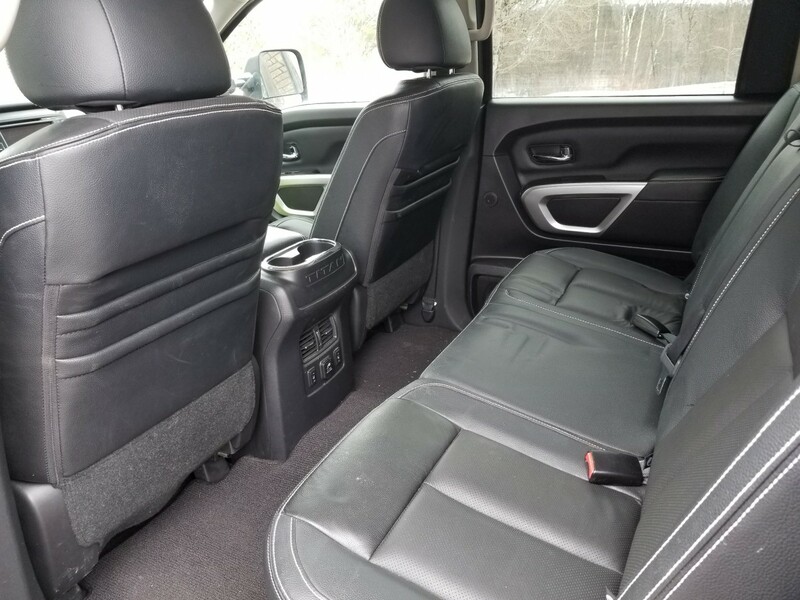 This truck is clearly larger, heavier and more capable than a typical half-ton truck, and this capacity does come at the cost of poorer driving dynamics, heavier weight and larger size. An additional concern is the Titan’s rather spotty reliability record. Consumer Reports had ranked the previous generation near the bottom of the pack when it came to full-size truck reliability. 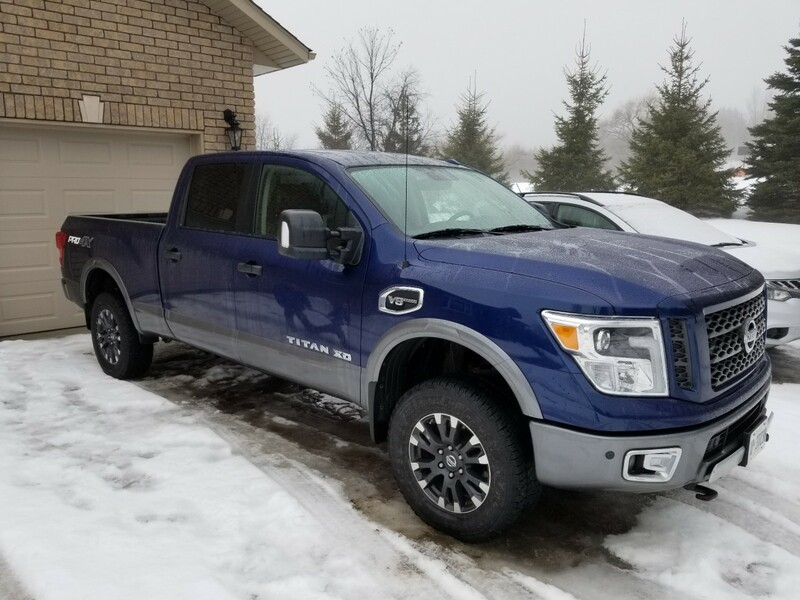 Car and Driver performed a long term test of a 2016 Titan XD, that was very similarly equipped to my rental, albeit equipped with the 5.0L Cummins diesel. Car and Driver pulled no punches when they chastised the performance, and reliability of this truck. That said, many of the problems encountered were specific to the diesel powertrain. The gas Titan XD has considerably better performance, more payload, costs significantly less, and doesn’t really have a big fuel economy penalty. C/D probably would have had better luck had they had a gas equipped truck. 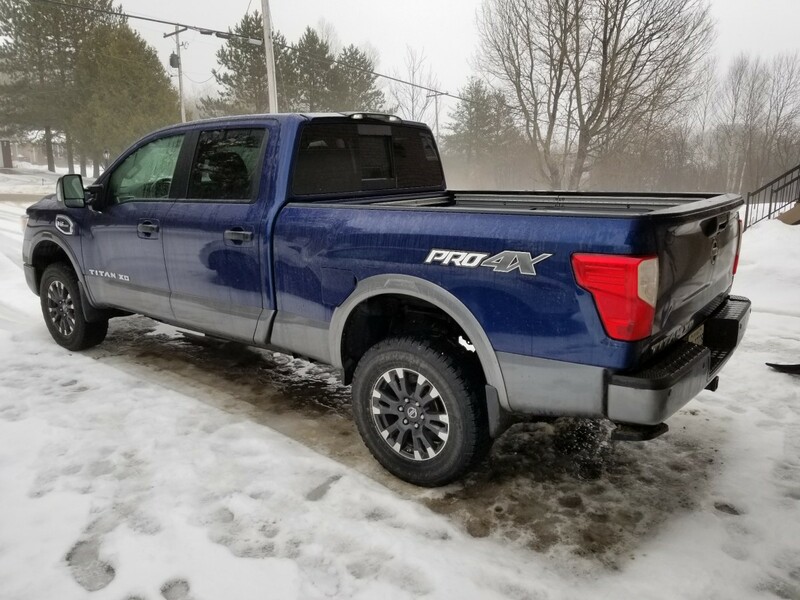 This Titan XD is a bit of an anomaly in the truck market, but I still think the truck fills a niche that has not been filled by the traditional trucks. The Titan XD has been criticized to not have much more payload than a half-ton while it close in size and weight to a ¾ ton. So what exactly is this truck good for? This is an ideal truck for someone who owns a truck to pull a large trailer semi-regularly, while still using it as regular transportation. While on paper an F-150 has comparable or more payload and tow ratings to a Titan XD, there is a little more to the story here. The pick-up market is all about one-upmanship these days, and manufacturers will seemingly do almost anything to have the best in category. Ford in particular, plays fast and loose with its payload and tow ratings, often quoting the F-150 HD Payload packages. While this package does exist, it is very limited in terms of which F-150 can be so equipped. Your typical loaded up F-150 crew with the 5.5’ bed can’t get this package. The fact is most payload ratings from pickup manufactures do not reflect the actual ratings of a typical truck. 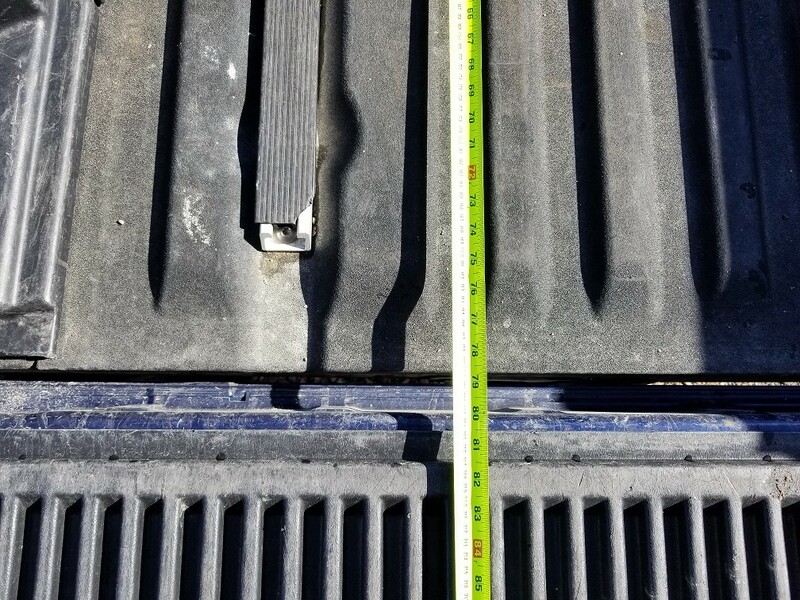 To calculate payload is very simply, take the GVWR rating of the truck and subtract the actual curb weight. The result is the maximum load for all cargo and passengers. Below is a chart with some real payload ratings, calculated from Car and Driver test results (C/D weights all tested vehicles). All weights are real world as measured by Car and Driver. All trucks in the chart are well optioned crew cabs, other than the 2017 Ford F-250 Super Cab. The F-250 Super cab was a very basic XL model with few options, and shows the great difference in weight when compared to a loaded F-250 Crew Cab Diesel. Furthermore, tow rating and horsepower don’t always equal a better tow vehicle. The Fast Lane Truck tested an Eco-boost F-150 against a gas-powered Titan XD in this towing test video. Although the F-150 was faster up the hill, in the end the Titan was picked as the winner as it was simply a better towing rig. The extra weight, the heavier duty frame makes a better more stable towing platform, even though it’s somewhat slower. One might argue, why not step up to a real ¾ ton? The other advantage to an XD is that it has a lower GVWR than a ¾ ton, which means it can skirt extra licence and regulatory fees related to heavier trucks. For instance here in Ontario, anything with a GVWR of 4500 kgs (9920 lbs) requires an annual inspection, which is most ¾ ton these days. The low beams were LED’s, with halogen high beams. The LED’s were a very bright white but didn’t seem more effective than halogens. The lighting performance overall was average. Although I think this truck is particularly well suited for a person who recreationally tows a large trailer semi-regularly, I question the size of this market. Nissan has the least brand power in the pickup market and these days it’s all about brand power. I am sure many die-hard pick-up trucks guys will write it off with out and real consideration. It is a decent truck, but certainly not a game changer that will draw brand loyal customers. So, I am not sure how many customers will be drawn to these trucks. They certainly are a rare sight in my area. While I question Nissan’s logic in introducing the Titan XD, I do give them credit for making a valiant effort. Not much to say about this truck, they are very reliable strong but i like the first gen much better. these are visually carbon copies of Ford pick ups. really blatent copies. the first gen looked more original. Vince, this is a terrific review. I’ve been curious about these for a while and reading your observations after having extended wheel time was beneficial. I’ve had one (well, maybe two) misgivings about these but it’s all cosmetic. First, these look a lot like the ’09 to ’15 model F-150’s up front. Second, the factory profile shot above makes it look like the base of the windshield is at a significantly lower point than is the midpoint of the hood – making it look like the hood is bubbled and there is a weak spot. That’s just my take. It’ll be interesting to see what effect if any these have in the NA pickup market. Brand loyalty is fierce but I’ve also seen a few instances of people buying what best fits their needs which rules out their preferred brand. Something tells me the 5/8 ton versions may be deceptively popular, relatively speaking. Looking at http://www.nissanusa.com (the site http://www.nissan.com is totally different) just now, I had no clue a regular and extended cab version of these was available. I agree with your assesment of the styling making it look like the hood is bubbled, but it is just an illusion. It has a flat hood from the driver’s seat. I can’t see this truck being a success myself, mainly because most truck write it off before any serious consideration There is nothing inherently wrong with the one I drove, and I think it is competitive with other trucks today, but it’s not really any better in any tangible way. But I have been wrong many times before, I guess time will tell. There’s a small town about an hour south of where I live that carries Chrysler products and Nissan products at one of its locations. I would have to imagine that selling one of these Titans when you have a lot full of Rams just a few feet away must be difficult. Trying to add to your share of the full-sized truck market will always be an uphill battle for Japanese brands, with Nissan working against a spotty reputation. You have to give them some credit for trying to create a new market niche. 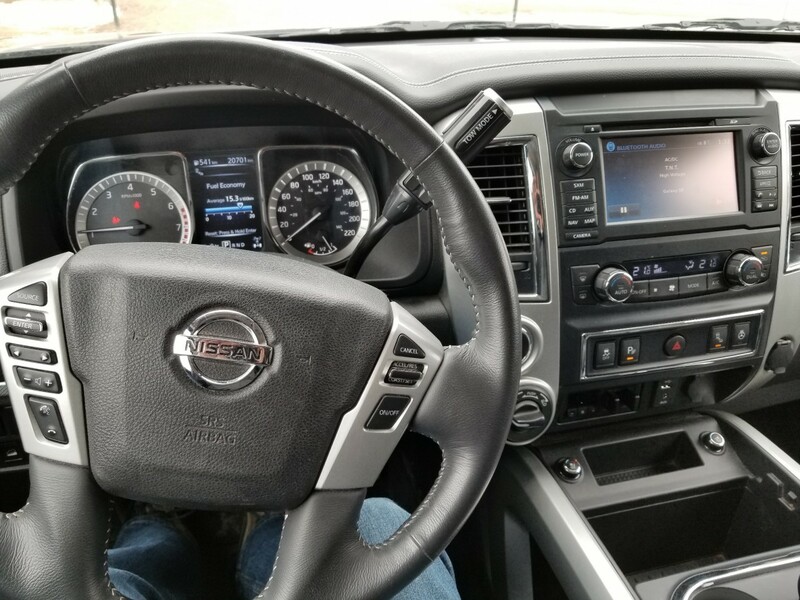 The Nissan blogs are filled with posts about their failing/failed CVT transmissions and the consensus seems to be that if you have one, it WILL die on you. I haven’t seen many, if any, posts about their earlier 4 speed transmissions at the one about my car that I go to the most. in reality, they’re dumb as rocks. Which takes all of the guilt out of eating them. on topic, I too question the size of the market for this thing. 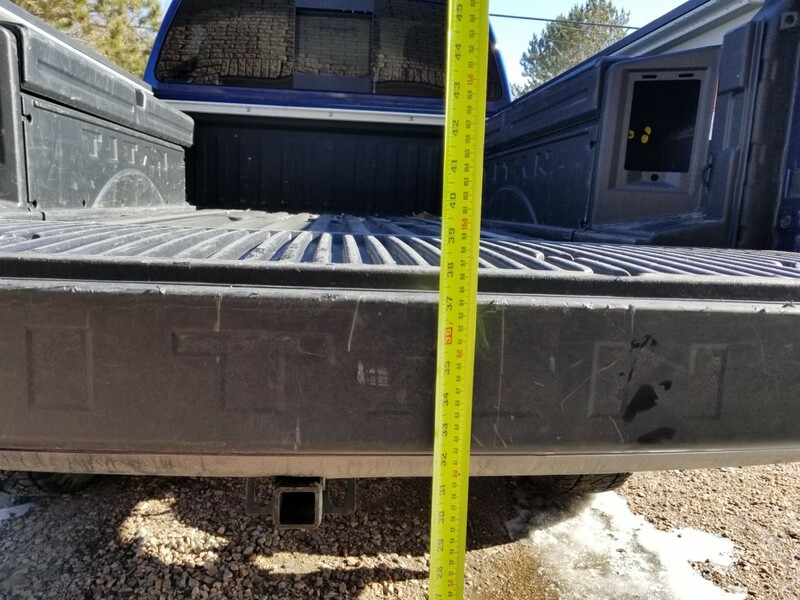 For all of the market positioning as a “tweener” or a 5/8ths ton truck, the one I drove (4×4 crew cab diesel) combined with the table above made me think that it wasn’t really smaller enough compared to a 250/2500-class pickup to make a whole lot of sense. the Cummins ISV is (IMO) the only “why buy” the XD has. Suicidal, DUMB and tasty. I feel no guilt at all. Deer B Q is really good, btw. When you drive the rural Arkansas highways at night right now, they’re everywhere, egging each other on and using deer pressure on the dumbest to jump at your car. As a firefighter/EMT in Central New York my dad has responded to several Deer versus vehicle situations. Those who swerve usually do not fair so well. ROFL!!! Just as well I’d finished my coffee before reading this, or….. The biggest issue with deer is that they’re quite destructive to crops and vegetation. Yeah, they’re ‘cute’, but the only true reason for their existence is simply as part of the food chain and to provide a meal for predators that might otherwise starve. So long as their population is properly controlled, deer serve a purpose, but it’s not to make the landscape beautiful. 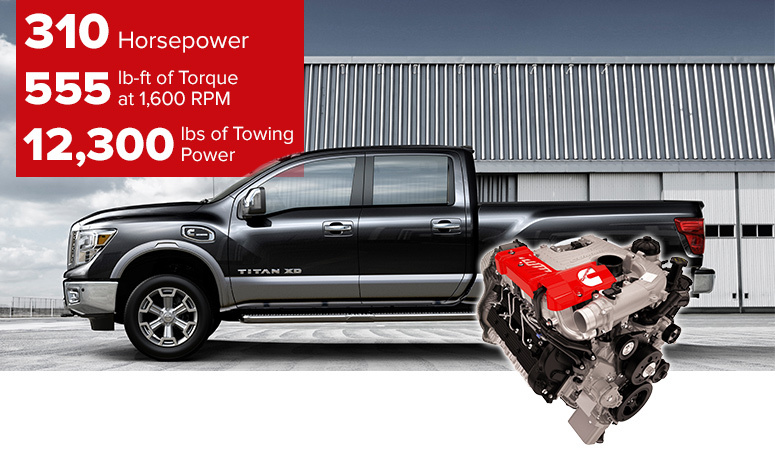 For generations, Nissan’s marketing has had a very bad habit of overstating the power/torque ratings of their engines. There have been many a road test comparison where the Nissan product, despite supposedly having the most powerful powertrain, actually scored near (if not at) the bottom of the performance ratings. All things considered, I’ve never much cared for anything Nissan has sold, and relegate them to the bottom-feeder category along with Mitsubishi, selling mainly to those auto consumers with the worst credit ratings (“But it was the only thing I could afford!”). I am not sure what CVT reliability has to do with a Titan? I agree the older generation Titan had some reliability issues. When I was shopping for trucks 6 or 7 years ago, I ruled out the Titan solely based on reliability. As for the engine, I should clarify; somewhat sluggish doesn’t mean it was slow. It just wasn’t as “peppy” as other lighter half ton trucks. Part of this was the extra weight compared to a half-ton. The other part is that this engine has relatively high horsepower and torque peaks, especially if you compared to something like an Eco-Boost Ford, but it’s not slow. I mean, this truck still does 0-60 in 7.4 seconds and the quarter mile in 15.8 seconds, and weights nearly 3.5 tons. What I was trying to say was that this engine doesn’t really come alive until the mid and upper RPM. It moves out very well for such a large hulking vehicle, and the V8 is very willing to rev. 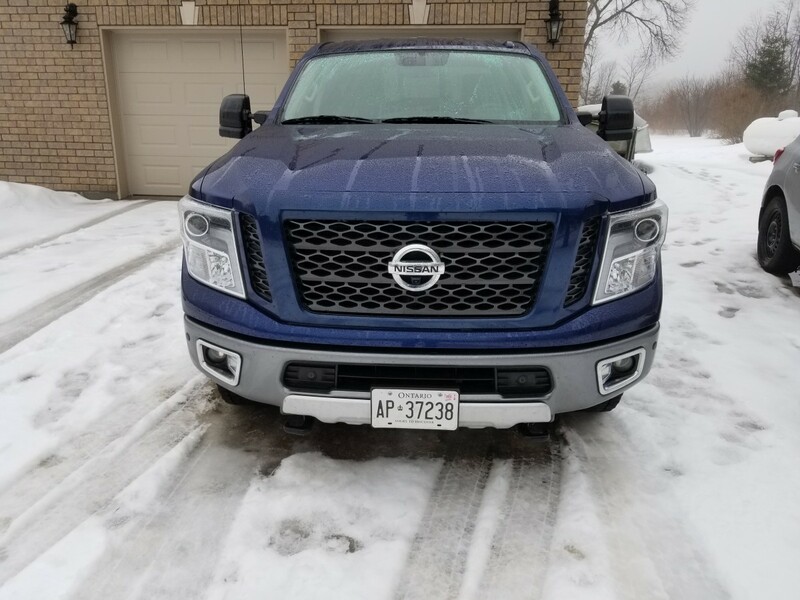 Compared to my BIL’s F-250 Super Duty with its 6.2L V8 (which has very similar power ratings), the Nissan has less bottom end power, but feels stronger in the mid to upper range. While the Nissan loved to rev, the 6.2L Ford felt unwilling to go to high RPM in comparison. In any respect, the previous generation truck was actually pretty quick despite its low 317 hp rating. I am sure a current half-ton Titan would be very comparable to a Ram Hemi for performance. Everyone looks at the peak power, but the old Titan engine had a lot of power under the curve. The new variant increased peak power, but really didn’t seem to fatten up the power curve much, as reflected by the minimal torque increase. So the performance increase isn’t actually as big as the numbers might suggest. You did well only busting up a lot of plastic on the front of your own truck. I have seen several car-deer collisions where the car suffered significant damage. When I first saw the picture I thought this was a Ford. I did not know that Nissan had a new version of this truck out. Here in central Indiana Ford, Dodge/Ram and Chevy/GMC trucks are everywhere. I am not sure I have even seen one of these. You are right that there is a lot of brand loyalty in trucks. Nissan would need a really, really good product to get customers out of their preferred brand. It doesn’t sound like this one is really it. I am amazed that they keep trying. since cars ride lower, they tend to take out the legs of cervids and cause the animal’s body to hit the windshield. moose are especially bad; they’re basically a 1,000 lb slab of meat on stilts. Yes, I lucked out JP. 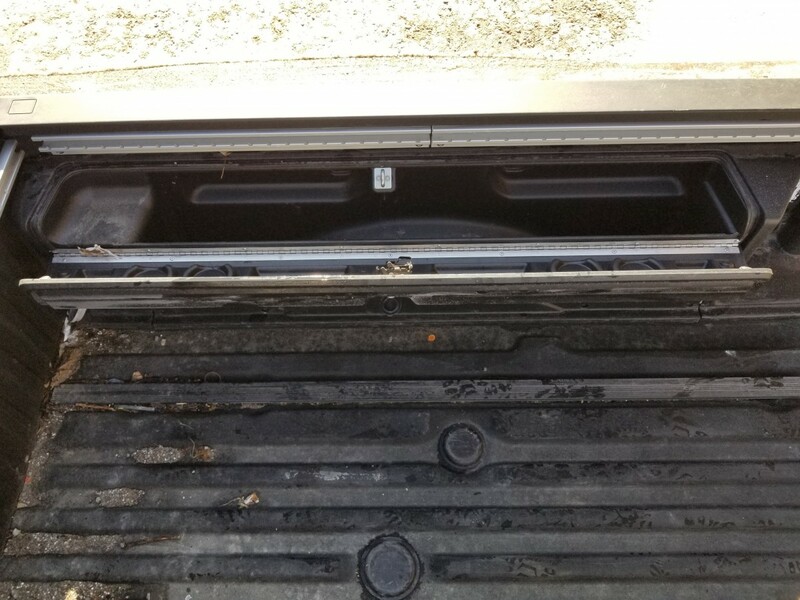 My truck has a plastic front bumper which was destroyed, but the reinforcement underneath was in perfect shape. If it had the chrome bumper I am sure it would have bent it and needed to be replaced, but wouldn’t have looked as bad. I actually prefer plastic bumpers for this reason. They are cheap and easy to replace and never rust. That said, it was still a pricey bill with the grille and headlight’s not being overly cheap parts these days. The only metal parts that got damaged were a couple of braces for the bumper cover and an A/C line got bent. My transmission cooler, and A/C condenser escaped unharmed. The Nissan’s have been popular here but have also been selling on price largely. In my impoverished area a vehicle that is going to sell purely on the monthly payment compared to its competition is always going to have some legs. As far as I know, the F-150 is built in Dearborn and Kansas City, while the Super Duty line is made in Louisville and Avon Lake, Ohio. Are they built anywhere else? No all Ford pickups, sold in the US, are made in those 3 plants. Chevy and Ram are the Mexican made trucks. Given profit margins it ought to be a no-brainer to make all BOF vehicles here in the United States. OHAP only makes Super duty chassis-cabs. Good review. I think I prefer the regular (non-XD) version of this truck line, and this engine is plenty powerful in the lighter duty version. The XD does drive differently than the non-XD, mostly due to weight. But strides have been made. If Nissan (and Toyota) don’t give up, and expand their offerings and learn from their lessons, another generation or two may make the difference. Building them exclusively in the US is a big step in the right direction that the US makers couldn’t necessarily claim and I haven’t heard of any durability issues with the Nissan engine (as opposed to the Cummins which makes one wonder what happened there). Expanding the lines as Nissan is doing with multiple configurations, cabs, bed lengths, and engine choices are also good moves. I personally enjoyed the Titan I drove at the launch and also test drove one at the dealer last year. I come to the truck market with zero preconceived notions and zero brand alliances. I didn’t buy one (any truck) but didn’t see anything to seriously dissuade me from the Nissan once price, build quality and materials were all figured in, at least for my potential use case. I agree with you Jim, the non-XD Titan would be more to my needs (and great review BTW). This XD was just too big and hulking for my needs. I am sure if I tried a regular Titan, I would have liked it more than the XD. Also, see my above comment about the power of the Nissan engine. It was powerful in the heavy XD too, but you felt the extra weight. It’s funny you mention having to justify to the neighbours. Even up here in Canada, there is this notion that only North American manufacturers can make trucks and that the Japanese are inherently inferior. If you buy one, the “truck guys” often question it. This attitude automatically rules out Nissan and Toyota trucks for many customers around here. It seems the majority of truck owners I talk to never even consider a Japanese branded truck, and really had not good reason as to why they didn’t. I do hope the Japanese keep up with their efforts. More competition only makes better products and more choices for all. Even with low numbers that Toyota and Nissan produce, the healthy profit margins make it worthwhile. I think the issue with Cummins is just diesels in general. They aren’t very good anymore due to modern emissions requirements. It’s taking some time for perception to catch up with the new reality. Is that the case? I was under the impression (perhaps a perception) that the 6 in the Ram 2500/3500 was the one to get. But perhaps not as of late. I really don’t know beyond having one 30yr-old “acquaintance” that has zero need for it but loves his purchased-new 2500 Ram Cummins and loves blowing black smoke with it after changing the programming…I went for one ride. Sure it has power (in the midrange, not off the line) but it can barely handle a turn, takes forever to slow, and seems best suited to sitting or laying in the back seat. Which I think is what he likes to use it for, but not alone if you catch my drift…:-) Kids these days…. There may be bright spots here and there, but in general, yeah diesels are less reliable than they used to be. Unless you do a lot of towing they don’t make much sense IMO. I don’t understand the current infatuation people have with their comeback in light pickups. More hype than substance IMO. I can’t believe Nissan sells a full size truck with less than 48″ between the wheel wells. That’s worse than some minivans. I believe that may be with the optional cargo boxes installed Without them the distance between wells is 50″ per Nissan’s website. This clearly shows that Nissan just doesn’t understand what US buyers want in a full size pickup and proves why they have never sold in any significant numbers. The bed screams it with the hold down rails on the floor being so far in the middle and the other’s up on the inner top rail with nothing down low in the corners to properly restrain many items. Less than 48″ width is just a bad joke. I thought the original Titan was competitive when it came out. This thing, not so much. I suspect it will be Nissan’s last full sized pickup. About the only reason to buy this truck is if you can get it for dirt cheap. There is much anecdotal evidence I read on the internet, that people are getting these XDs for considerbly cheaper prices than say a Ford F-250. If that is the case, it does help these trucks make more sense. When I looked up the MSRP’s though, the prices weren’t far off, which is why I didn’t include this information in the write-up. I should also mention, those cargo boxes are removable. With the boxes removed you’d have a proper box width. The width with them in place was reduced, so you’d have to remember to remove them before the trip to the lumber yard. Thanks for the excellent review. I always thought these seemed pretty mediocre, especially given the segment they ostensibly compete in. Nissan is cutting their NA production by 20 percent this year. The Titan is one of the reasons why. Thanks for this in-depth review. I learned a lot about a vehicle I don’t know much about except the basic specs. In principle, the 5/8 concept makes a lot of sense to me, as I know there’s more than a few folks who buy 3/4 ton trucks for the looks and image and not out of necessity. While there are some people who buy 3/4 ton trucks for image, The vast majority are bought out of necessity. I don’t know anybody who owns one who doesn’t need it. 1/2 tons are a different story. I don’t think the 5/8 concept makes sense anymore. There used to be “heavy half” versions of half tons that filled this niche. Today regular 1/2 tons have gotten capable enough to meet most people’s needs and overlap this XD. This is a really narrow market Nissan is targeting, I can’t fathom what their product planners were thinking. I agree with Paul, lots of 3/4 ton trucks are overkill and bought for image, especially for the “coal rollers” crowd. Sure there are many owners who can justify a 3/4 ton truck, but how many outside of commercial use truly need one? Don’t get me wrong, I am all for buy what you want, it’s a free country, but I think the line between people’s wants and needs often gets blurred. The difference between this Titan and the old “heavy half tons” is that a heavy half ton was essentially a half ton with more capacity. This is more like a light 3/4 ton, as it includes the considerably more beefy chassis, suspension and brake setup. Well in needs I mean if I want to pull a 30′ camper, I would need a 3/4 ton to do it. I wouldn’t “need” that camper, but if I want to pull it a 3/4 ton is the best tool for the job. It’s pretty rare, at least here in the Midwest, to see a 3/4 or 1 ton truck that’s not used for heavy hauling. Even here they are too unwieldy to make good daily drivers. So I do not believe Nissan has targeted this truck at people who wouldn’t use it. They wouldn’t bother with a separate frame for that. 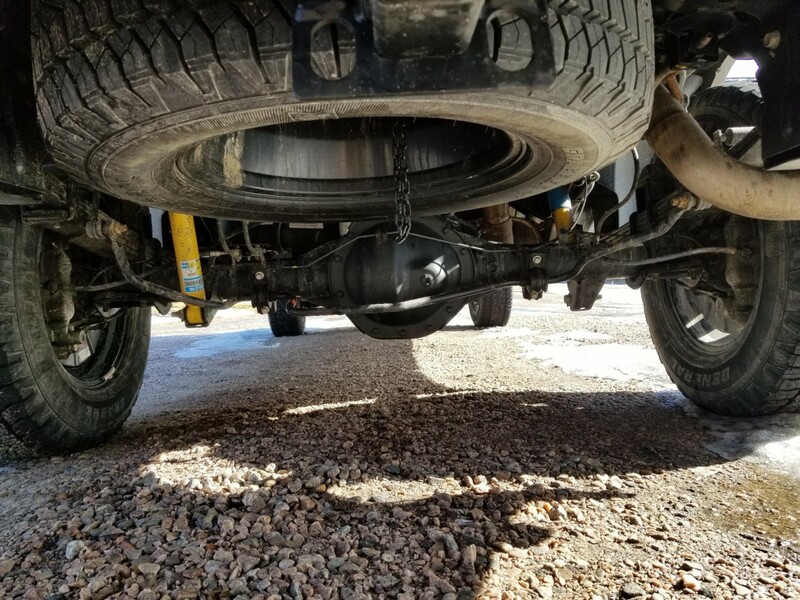 You are right that heavy half tons did not go to the same extent as this one, but they typically did beef up the suspension and axles. My point is that they covered the same niche, a niche that pretty much disappeared as standard 1/2 tons started overlapping the capabilities of 3/4 tons. Phil, I was being a bit tongue in cheek with my response. Sure a 3/4 ton is the best tool to tow a 30 foot trailer, but who really needs a 30 foot trailer? Why not a 24 footer? Growing up we had a family of 6 plus in a 24 footer and sometimes we added the grandparents. Just trying to be smart about the want vs need thing and yes I know how much nicer trailer are these days. In any case, I do agree with you, if you are pulling a big heavy trailer a 3/4 ton is much better than a 1/2 ton. I have a friend that pulls a massive fifth wheel that weights something like 14,000 lbs and he uses his F450 to do it. He also daily drives it too (they do have another more economical vehicle that gets used more often for daily duties). His truck is sized right for the job. And I also agree the concept of a heavy half-ton is the same as these Titan XD’s. I was just pointing out the execution is different. My dad actually owned a ’79 F-150 (which was the heavy half ton at that time) when we had our ’77 Prowler 24′ trailer. Yeah, the F-100 was the standard half ton back then. Gotcha, yeah I make sure my needs never exceed what a 1/2 ton can do because I don’t want a 3/4 ton (and my wife would refuse to drive it). In fact, I’m now evaluating whether or not I can get by with something smaller because I don’t like how 1/2 tons keep growing larger, but unfortunately smaller trucks just don’t seem to be designed to haul 5 people on a regular basis. Narrow, no center head restraint, etc. In any case, thanks for the great review and subsequent discussion! It seems like the XD overall is an answer to a question no one (or very few) asked. All the disadvantages of a 3/4 ton (too heavy, too ponderous for daily driver use) with none of the advantages of a half ton, such as they may be (better entry and exit, better handling in city traffic and parking decks than a 3/4 ton). But, I can see a niche for sure, and I guess that’s what Nissan is gunning for. Someone who wants to daily drive this, but also wants to tow a fifth wheel a half dozen times a year. Perhaps a really heavy boat. A half ton can’t tow most fifth wheels, especially if you have one or more slide-outs. But a 3/4 ton is just overkill for the other 90% of the time. The XD would appear to straddle that gap nicely. You hit the nail square on the head and share my thoughts exactly on this truck. As I posted above, apparently people are getting these XD’s at pretty good discounts. If you can get one significantly cheaper than a 3/4 ton, and only recreational tow, then I can see these making some sense. It seems that virtually all modern full-size pickups I see here in Australia are 3/4 ton or higher, and looking at the weight/payload table it is not hard to see why. The Ram could exceed the payload with passengers only. Alternatively could it carry a viable tongue weight for its towing capacity? It makes sense for Nissan to try and carve out their own niche with the XD truck, but I wonder if they have got the execution right?